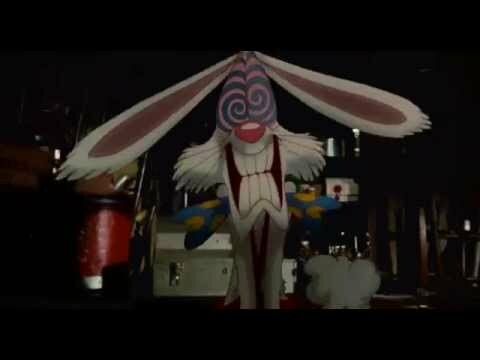 Everybody must know “Who Framed Roger Rabbit?” back to front by now – for me, it was the first film I remember seeing in a cinema, and was watched every day once it arrived on home video. Therefore, we can all picture the scene where Doctor Doom walks into the Cloverleaf tram station bar, looking for Roger, who has been hidden in a back room by Eddie Valiant. Doom then starts tapping out a rhythm on the wall, knowing all too well that a “toon” cannot leave it unanswered. For me, that was the first time I really became aware of a rhythm that is so ubiquitous, it isn’t clear who made it up in the first place – Wikipedia places an early use of the phrase in a song from 1899, Charles Hale’s “At a Darktown Cakewalk,” while the phrase may have been established by the time the novelist Joel Sayre used it to describe boats tooting their horns, in “Hizzoner the Mayor” (1933). For those thinking the musical phrase was as cockney-sounding as Danny Dyer, the news is might be American in origin might be a bit disappointing, but because it is so ubiquitous that this cannot be proved either, Chas and Dave can continue to rest safe. In both cases, it seems that what is so usually added to the ends of songs, or used as a quick and handy thing to say, has grown by osmosis: it grew in the collective unconscious, in the minds of songwriters, and of those about to knock on someone’s front door, with no-one able to take the original credit. However, if it can be used in songs as far away from each other as Harry Champion’s “Any Old Iron,” to “Gee Officer Krupke” from the musical “West Side Story,” at least one person has missed out on royalty payments to make them richer than Bill Gates. I wish it were true, having checked the contents online – this worked for American prisoners of war in Vietnam, to check if the people in the room next door were friend or foe but, at least, they do get the “da-da-da-daaah” of Beethoven’s Fifth Symphony instead.